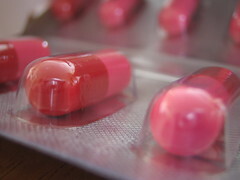 Finally took myself to a doctor, came out with a prescription for yet anoher variation on penicillin – this time it comes in pink and red capsules. Awesome. I was also talked into having another day off from work tomorrow by the GP. Dude, you have like no immune system. I had no immune system, then a dietitian found out I had an alergy to dairy. Cut the dairy, grew an immune system. Moral to the story: see a dietitian. Might help, might not, but dude, you’re sick too much to not consider the option. ugh I think I had a sniffle of some sort from February through to June, accented with feeeling properly sick in May and maybe March at points. I’m not as bad as in May now, it’s just persisting, which is why I caved and went in to the drs. I had hoped it would clear up. I was healthy is January and for the month of July. Both sunny warm months for me with minimal stress, work and contact with children. Is there a vegetable I can eat that will make me immune to children while warming up my body? Is it ginger? Ergh, some people crap on about different foods and herbs boosting your immunity, but from a scientific standpoint there’s nothing that I’ve learned (so far) that does anything specific for the immune system other than a complete diet and excercise. If ginger and garlic were so great you might think indonesia would have a lower rate of disease. But your major immune system killers are stress, poor sleep, poor nutrition. Maybe I should just be taking better care of myself?